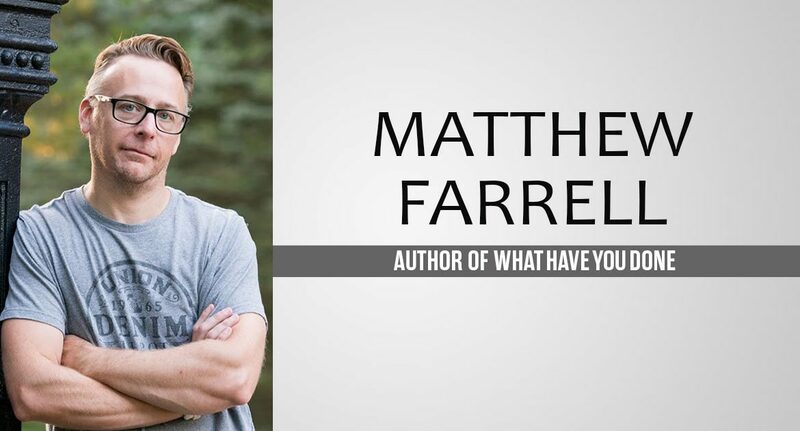 Matthew Farrell was born into a police officer’s family and raised in Peekskill, New York. His short stories have been featured in the world-renowned fantasy/horror publication Heavy Metal Magazine, and he has done spec script writing for Hollywood. Matthew continues to live in the Hudson Valley with his wife and two daughters. What Have You Done is his debut novel. When a mutilated body is found hanging in a seedy motel in Philadelphia, forensics specialist Liam Dwyer assumes the crime scene will be business as usual. But the victim turns out to be a woman he had an affair with. And there’s a bigger problem: Liam has no memory of where he was or what he did on the night of the murder. An edgy crime thriller reminiscent of a CSI episode, What Have You Done is an explosive debut by Matthew Farrell. The novel is a cross between a domestic suspense and a hard-bitten crime story, opening with a mutilated body investigated by forensics specialist Liam Dwyer…. Can you tell me a little about the quirky, philosophical you that your readers might not know? I guess my two quirks would be my routine during the writing of a book and the fact that I’m a Pantser. I work a day job so I need to manage my time closely when I’m working on a book. During the writing process, I come home from work, go to the gym to get my energy level back up, eat dinner with the family, and then I’ll go write for a few hours. I also write from about 9-1 on the weekends. This routine is always the same. I write through the entire book without editing along the way. This helps when you’re on deadline, which is something new for me. I don’t waste days going over work from my previous sittings. I just push through and get it done, knowing there will be plenty of time (and rounds) to edit. Yes, I’m a Pantser. When I’m starting a novel, I typically have a beginning and a vague ending, but have absolutely no idea how I’m going to get there. I just start writing and let the characters take me where they take me. In fact, I came up with my final twist of my new book halfway through writing it, so when I was done, I had to go back and rewrite the first half of the book to fit with the twist. That can get annoying, but I have no mental capacity to outline so I’ll be a Pantser to the end. This is your debut novel. How has being published changed things for you? Do you still write the same, or is there more/less pressure now? The process itself is still the same. I still write after dinner and all weekend, but writing after you’re published is VERY different in terms of audience and pressure. I’m currently suffering through the second-book second-guessing that, thankfully, is common in the industry. This time around I know I’ll have an audience waiting to see if my next book is as good as the first or if I’m a one hit wonder. That can play with your mind. Will they like this story? Will they relate to these characters? Is this deadline too tight and taking away from the story’s build? What do the readers love about the first book and am I carrying that through to the second? These are all head games that I have to work through, and with the encouragement of my agent and editor, I’m just writing the book that’s in me and we’ll take it from there. I think the new book will resonate with the readers. I’m happy with the first draft and eagerly await editorial notes. How many books did you have to write before getting this one published? I probably wrote ten books before this one got published. In fact, the first draft of WHAT HAVE YOU DONE was written in 1998. I kept coming back to it every few years to tweak or rewrite because I loved the idea so much. And here we are. But I feel like a new writer must go through a few manuscripts before they can find their voice and learn how to build a proper story for an audience. Surviving for Dummies, so I can learn to live off the land (I’m stranded after all.) The Shining, because it’s my favorite horror/suspense book of all time. A Christmas Carol, because it’s my favorite book overall and I read it every year. Let’s talk about What Have You Done. Where did the idea came from and what inspired you to write it? What Have You Done is about two brothers who work for the Philadelphia Police Department. One is a homicide detective and one is a forensic specialist. As they’re both investigating the murder of a woman they know, they begin to suspect each other could be her killer. I come from a family of cops, so I know firsthand how loyal that bond is. Cops are an extension of blood relation, so I thought it would be intriguing to not only put that bond at risk by testing loyalties within the realm of a murder investigation, but I thought I’d add to the stakes by making the characters blood related as well. If you suspected your brother or sister or mother or father of a crime, could you turn them in or would you look the other way? That’s the ultimate question here. What actors would you cast to play Liam and Sean? To be honest, I don’t really think about it because when I create a character in my mind, they’re mine. No actor can substitute the mental image I have of these characters. My sister-in-law recently suggested Ryan Gosling as Sean and Jake Gyllenhaal as Liam. That sounds good to me. One actor I see very clearly as a character, however, is Lance Riddick as Lieutenant Carter. He’d be perfect, but Michael Connolly seems to be keeping him busy with another season of Bosch (one of the best shows on TV), so I guess I have to wait patiently. What do you think readers will love about What Have You Done? I think they’ll love the fast pace of the story. By the second sentence you’re off and running and don’t really take a breath until the end. Some reader feedback I’ve gotten so far has been their love of the realistic police settings, the characters being authentic, and the pacing. Those are all super compliments as far as I’m concerned. I love that the audience is enjoying this book. Was the ending planned from the beginning or did it evolve as you wrote it? The end was planned, but the way in which we got there changed during the editing process. It turned out for the better, but the end was different in the original text. The killer and the motive never wavered though. To be honest, I just want the readers to be entertained. You don’t have to come away from any of my books with anything. I’m just trying to offer an escape from whatever someone has going on in their life. Whether it’s a hard day, a loss, the general vibe of the nation these days, or anything else, I just want to give my readers a chance to crack a book and take in a story that will get them away from their lives for a bit. If I can do that, then I’ll consider it a success. What is the publication date and where can readers buy What Have You Done? Available October 1, 2018. Readers will be able to find the book on Amazon, Barnes & Noble, Target, and some local bookstores. First draft of the new book is done and currently sitting with my editor. It’s called I Know Everything and is due to be released on August 6, 2019. It’s about a renowned psychologist whose wife dies in an automobile accident after driving off the edge of a cliff. An investigation reveals that she was dead prior to the accident, and the accident itself was just a cover for her murder. At the same time the psychologist is finding this out from the police, a mysterious man arrives at his office with details about his wife’s accident the police have yet to discover. And he knows more. He knows secrets no one else should or could know. The psychologist must find out who this man is, what he wants, if he’s responsible for his wife’s murder, and what secrets he holds that could be worth killing for.